If you’re living with lupus, have you found any particular foods that affect you and your condition — for better or worse? Member Jeanette (JeanetteA6872), a member of the 2018 Team of Advisors who’s living with systemic lupus erythematosus (SLE), shares which ingredients she tries to include or avoid in her diet, plus three of her favorite recipes (psst—one involves zoodles!). Here’s what else she shared with us in a recent Q&A. Everyone is different, so these foods and dietary changes may not affect you and your lupus the same way. Talk with your doctor or a registered dietitian about finding foods that work for you. Have you noticed any specific ways that your diet or certain foods affect your symptoms? I didn’t go on any specific diet at first, I started eliminating certain foods like sugar (which was causing major fatigue and pain), garlic (causing major inflammation in my knees), eggplants (fatigue and pain in my feet), bean sprouts (stomachaches) and alfalfa (full inflammation and full flare) — some of the known foods that lupus patients shouldn’t eat [learn more at lupus.org]. Then I noticed how meat was causing me fatigue and I noticed inflammation directly in my knees. I tried giving up red meat for two weeks, and I felt good and noticed a reduction of pain. Then I gave up chicken the following two weeks and felt even better. It was so amazing that I decided to give it up for good. After the first few months without meat, my doctor started noticing my blood work was improving drastically, so she began reducing my medications since I was no longer flaring or feeling pain. After a full year she reduced all of my medications to zero and even stopped my infusion. I notice that if I eat too many potatoes like French fries, baked potatoes or mashed potatoes, as well as tomatoes, salsa, mushrooms and peppers, ice cream and cheese, I feel a little stiffness, so I know it’s too much. I really try to avoid processed and fried foods in general as I immediately notice stiffness. I do still eat gluten and dairy products, just not every day. Everything in moderation works best, I’ve noticed. If something bothers me this week, I know not to repeat it. Are there any foods that you try to eat often? I don’t eat many of the same foods daily. I drink my shakes, but I like a variety of foods from pastas, salads, homemade cauliflower crust pizza, rice and beans, and I started eating fish again, so that’s more protein. There are meat substitutes like Gardein, Beyond Meat and black bean burgers that make great meals. With the new eating style, I knew I needed to find some type of supplement for my vitamins and minerals because you get so many different vitamins from animal products and I wasn’t eating the same way as before. I tried Herbal Life, then Shakeology, then Modere, and none agreed with me because I have so many allergies. So I gave Isagenix one last try. It was perfect for me. Wow — my blood work started coming back so good, my doctor asked me what my secret was, since I [also] started working out and feeling even more amazing. I feel as if my life is back. Do you have a few favorite recipes you’d like to share? 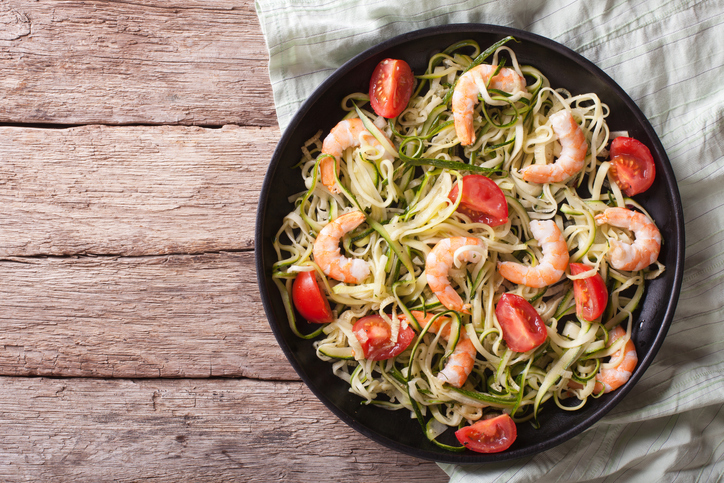 Creamy zucchini pasta with shrimp – “Zoodles” (julienne-peeled zucchini “noodles”) and an avocado-basil “cream” sauce? Yum! Which foods do you eat or avoid with your lupus in mind? Please add a comment below or join PatientsLikeMe to chime into this forum discussion!